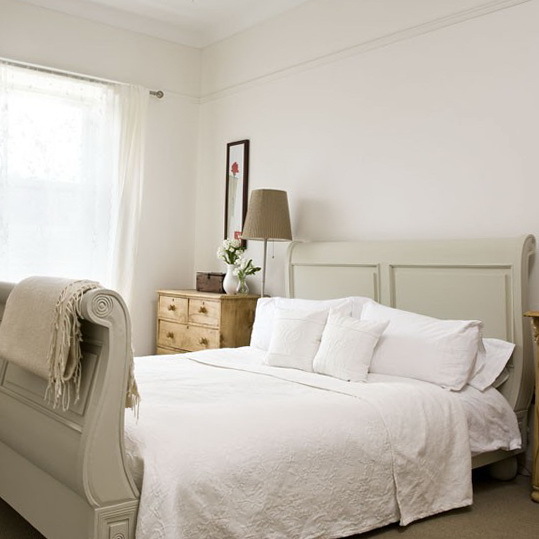 Create a soothing style in a country bedroom with simple pastel linens, chalky walls, and minimal accessories. 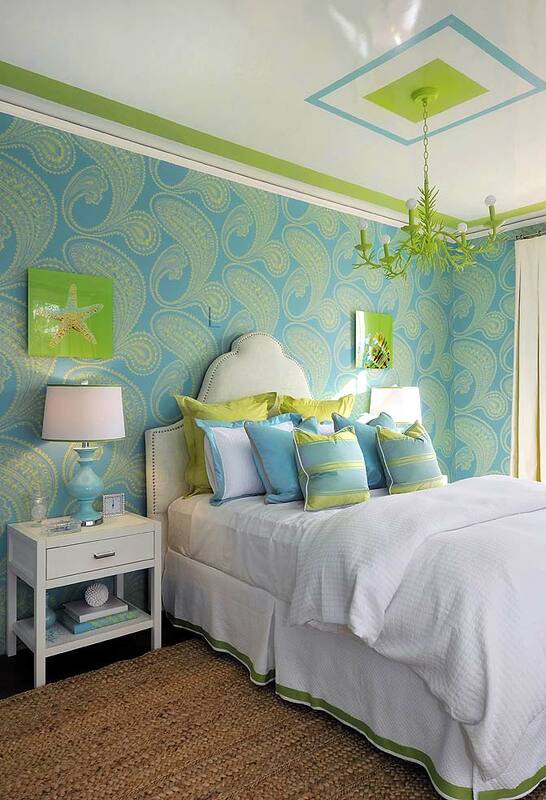 In this scheme, a carved upholstered headboard and a striking piece of wall art add definition. 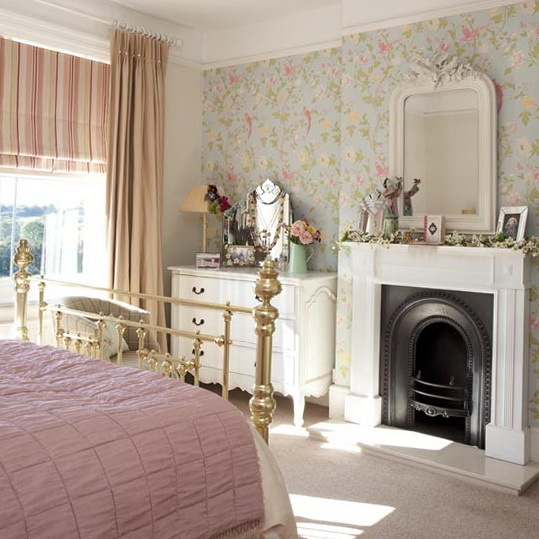 In this traditional country scheme, bold floral wallpaper and striped blind fabric combine to create an informal look. 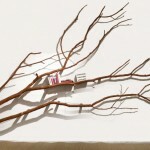 Plenty of foliage and decorative accessories add a whimsical touch. Wooden floor, a pretty fireplace and a gilt overmantel mirror combine to create a traditional country scheme, with chests of drawers in each alcove adding a sense of symmetry. Create a fresh look in a country bedroom with modern stripes and layered linens. 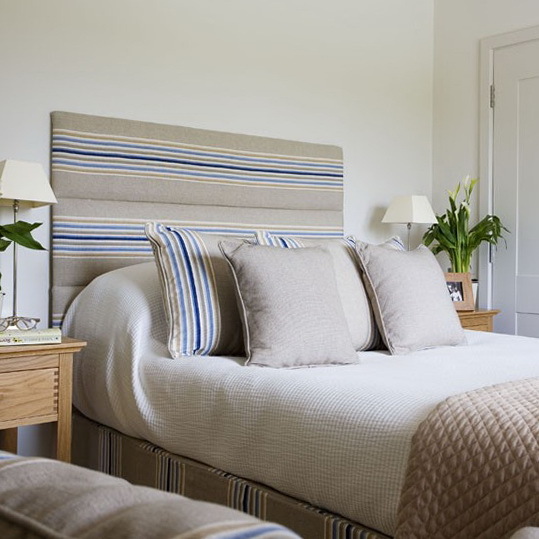 Here, a valance and headboard upholstered in blue and grey stripes adds interest to an otherwise simple scheme. 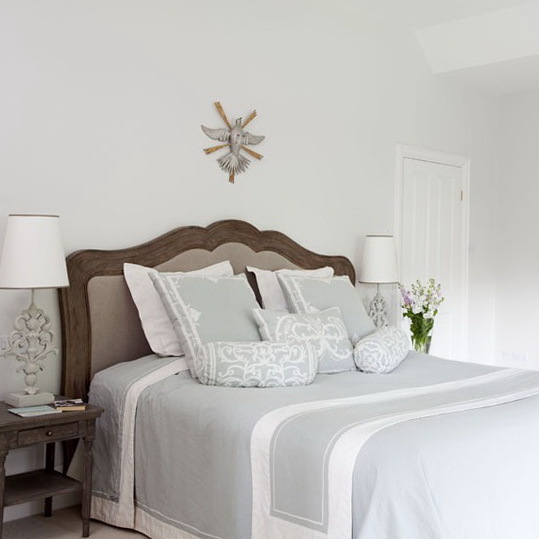 Using a selection of tonal whites and stones can create a calming look in a country scheme. 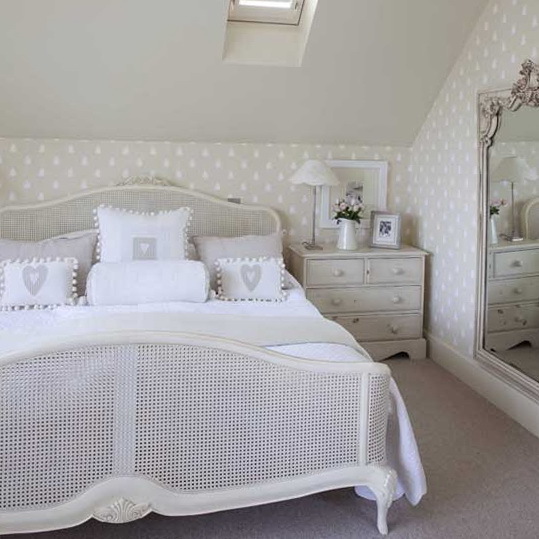 Here, a French-style cane bed and an ornate mirror add informal grandeur to an attic bedroom. 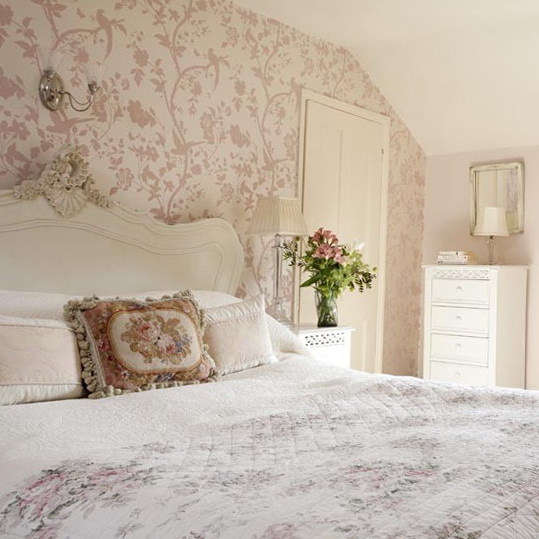 Create a cosseting country feel in a compact bedroom with subtle florals. 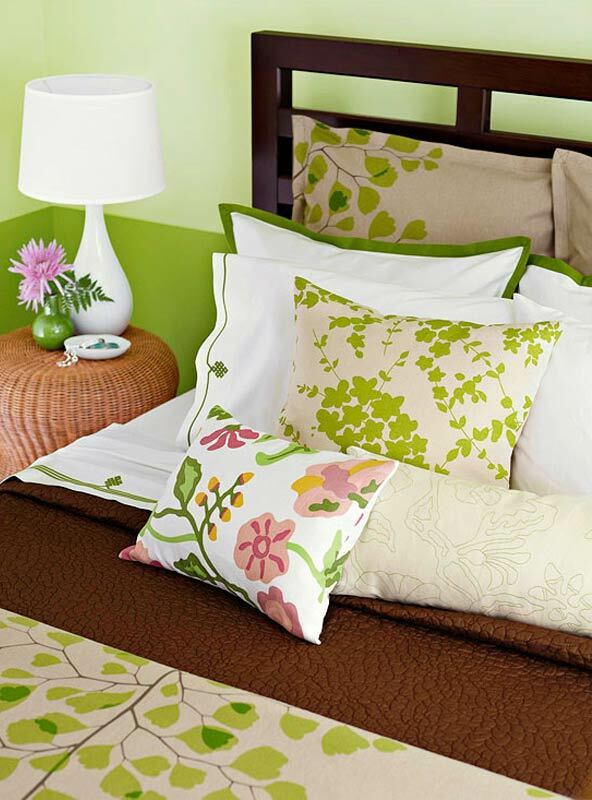 Try layering pattern with a pastel floral wallpaper and elegant bedlinen. 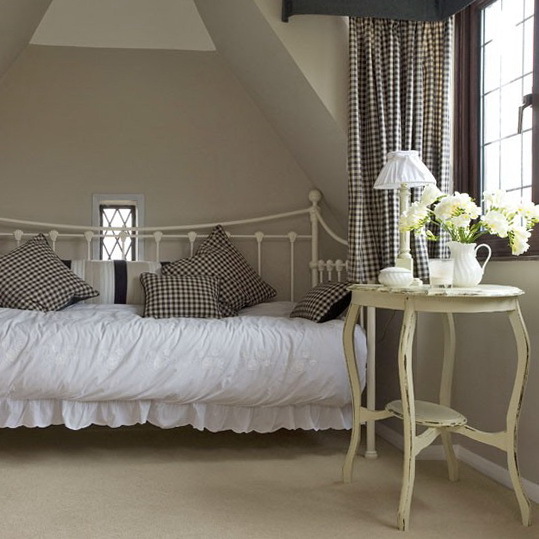 Add a cosy corner to a country bedroom for reading and relaxing. 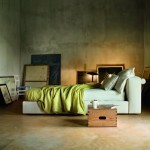 Here, a butler’s tray table, a comfortable armchair and a painted chest of drawers creates an elegant tableau. 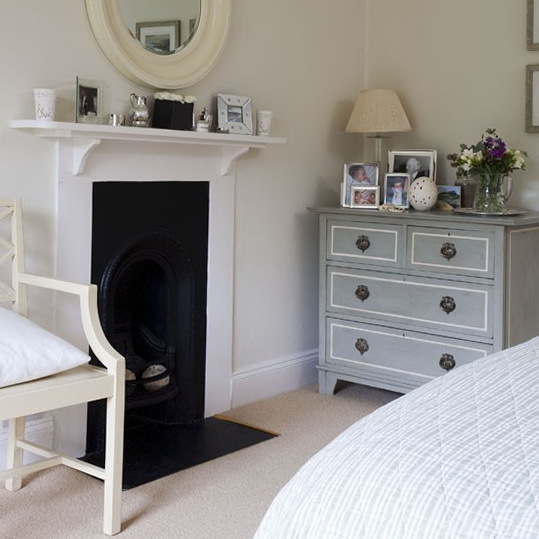 Layered neutrals create an elegant look in this country bedroom, where a simply painted fire surround and an antique chest of drawers take centre stage. Consider using one piece of statement furniture to set the tone in a country scheme. Here, a traditional bateau lit bed painted in a chalky stone adds an air of rustic elegance. 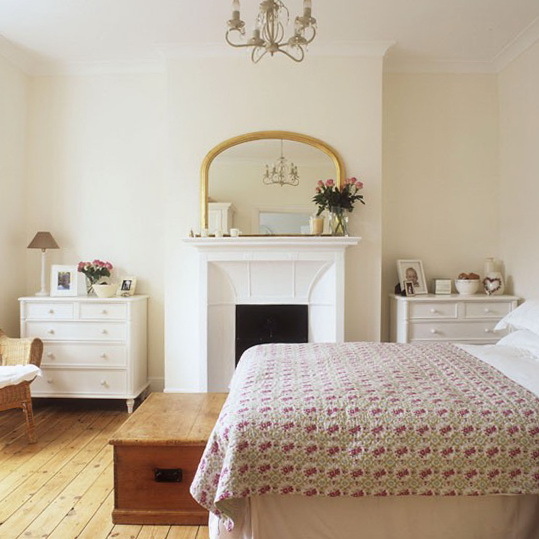 In this laid-back scheme, a wrought-iron day bed fits neatly under the eaves of a small bedroom. 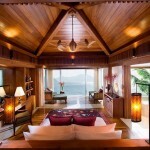 Checked cushions and curtains add to the rustic feel.